The serial interface information to jump-start projects on several platforms. 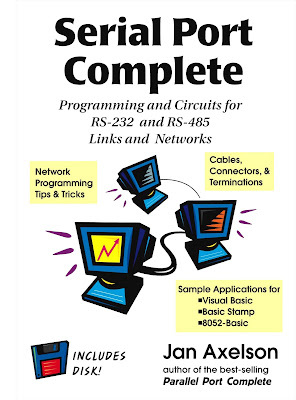 This it the first book to have extensive on RS-485 , a widely used, industry standard interface for networks. This reference features original content based on the author's firsthand research and experience, not just rewritten specifications and marketing materials. Programmers, engineers and developers will use the designs in this book to get projects up an running quickly. Installation and maintenance staff will find tips for ensuring reliable operation and problem tracking. Students and computer enthusiast can use the book's complete, original examples and tools to design experimental projects for several computer platforms. La información de la interfaz serie para echar a andar proyectos en varias plataformas. Este es el primer libro que tiene una amplia sobre RS-485, ampliamente utilizado, la interfaz estándar de la industria para las redes. Esta referencia incluye contenido original sobre la base de la investigación del autor y la experiencia de primera mano, no sólo a las especificaciones reescrito y materiales de marketing. Los programadores, ingenieros y desarrolladores utilizar los diseños en este libro para proyectos de hasta un funcionamiento rápido. Instalación y personal de mantenimiento encontrarán consejos para asegurar un funcionamiento fiable y seguimiento de problemas. Los estudiantes y entusiastas de ordenador pueden utilizar completas, ejemplos y herramientas originales del libro de diseñar proyectos experimentales para varias plataformas. The PC's Serial Port from the Connector In. Linking Two Devices with RS-232. Connectors and Cables for RS-232. Options and Choices. The Computers. The Programming. Languages and Operating Systems. Message Properties. The Link. Applications. Formats and Protocols. Sending Serial Data. Synchronous Format. Asynchronous Format. System Support. Transmitting a Byte. The Bit Format. Autodetecting the Bit Rate. Data Formats. Binary Data. Text Data. Preventing Missed Data. Handshaking Buffers. Polling and Interrupts. Acknowledgments. Error-checking. The PC's Serial Port from the Connector In. Port Architecture. The UART Enhancements. Port Resources. Finding Ports. Port Information in the Registry. Configuring. New Systems. Adding a Port. Using Older Hardware. Internal vs. External Devices. IRQ Conflicts. Solutions for Multiple Ports. Inside the UART. Interrupt Sources. Control Registers. New Functions. PC Programming. Using MSComm. Properties. Text and Binary Transfers. Polled Communications. Using OnComm. Handshaking Options. A Template Application. The Main Form. General Routines. Selecting a Port. Saving Data. Other Ways to Access Serial Ports. API Functions. Direct Port Access. Using Older Basics. Visual Basic Versions. Accessing Ports under DOS. Microcontroller Serial Ports. The 8051 Family. The Serial Port. Interfacing Options. The 8052-Basic. Communications Abilities. Processing Received. Data Custom Communications. The Basic Stamp. A Firmware UART. Signal Levels. Stamp-to-Stamp Links. Adding a Hardware Serial Port. Options. An SPI/Microwire UART. Linking Two Devices with RS-232. About RS-232. Features. Signals. Voltages. Timing Limits. Converting between 5V Logic and RS-232. The MAX232. Other Interface Chips. Short-range Circuits. Port-powered Circuits. Alternate Interfaces. Direct Connection. Other Unbalanced Interfaces. Connectors and Cables for RS-232. Connectors. 25-pin Shells. 9-pin Shells. The Alt A Connector. Modular Connectors. Adapters. Cables. Length Limits. How Many Wires?. Isolated Links. Ways to Achieve Isolation. About Grounds. Power Supply Grounds. Optoisolating. Surge Protection. Troubleshooting Tools. RS-232 Applications. Linking Two Computers. A 2-PC Link. Selecting a Remote CPU. PC-to-Basic Stamp Link. Exchanging Data. Ensuring that the Stamp Sees Incoming Data. PC-to 8052-Basic Link. Ensuring that the 8052-Basic Sees Incoming Data. Exchanging Data. Simple I/O. Accessing the Signals. Connecting to a Stand-alone UART. Controlling Synchronous Interfaces. Operating System Tools. Direct Cable Connection. DOS Interlnk and lntersvr. Links and Networks with RS-485. About RS-485. Balanced and Unbalanced Lines. Voltage Requirements. Current Requirements. Speed. Adding an RS-485 Port. PC Expansion Cards. Converter Chips. Converting TTL. Converting RS-232. Short Links between Different Interfaces. RS-485 Cables & Interfacing. Long and Short Lines. When Is a Line Long?. Calculating Line Length. Line Terminations. Characteristic Impedance. Adding a Termination. Effects of Terminations. Reflections. Terminations for Short Lines. Choosing a Driver Chip. Network Topologies. Open and Short-circuit Biasing. Open-circuit Protection. Short-circuit Protection. Cable Types. How a Wire Picks Up Noise. Twisted-pair Cable. Selecting Cable. Grounds in a Differential Link. Ensuring a Common Ground. Isolated Links. Extending a Link with Repeaters. Network Programming. Managing Traffic. Steps in Exchanging a Message. Protocols. Addressing. Assigning Detecting. Other Information in Messages. Using Existing Protocols. Transmitter Enable Timing. Two Networks. An RS-485 Network. The Protocol The Link. The Master's Programming. Selecting Nodes. Slave Programming. A Simple Stamp Network. Debugging Tips. Appendices. Resources. RS-232 Signals. Number Systems.